Music is to the soul what words are to the mind-Words are the pen of the heart, music the pen of the soul. Quote by Modest Mouse. This decade has seen the highest rise in African artistes, African music, international recognition as well as international collaborations more than ever. We are now seeing Afrobeats breaking the international barrier that Reggae broke decades ago. I would like to analyse, the best way possible, and in my own opinion, how this change came about. First up! What is Afrobeats? The clue is in the name here…Afro (African) Beats (music). I will define Afrobeats as music whose roots and inspiration derives from Africa, by Africans (not necessarily indigenous to the continent)which might have a fusion of western styles and/or beats, as well as elements of cultural, political, social, historical and other factors attributed to the African continent. Afrobeats is a subset of African music which appeals more to the younger generation due to its close resemblance in style and beats to international genres. The origin of afrobeats in my own opinion can be traced back to the mid-60s-early 70s when Fela Anikulapo- kuti started his band Koola lobitos (later known as Afrika 70 then egypt 80)and took the world by storm with performances all over the world. This brought about widespread attention to this “different” style of music which had elements of the African culture, African percussion instruments, gongs, as well as trumpets, tambourines, pianos, electric guitars and so on. The amalgamation of local and foreign musical instruments and style is what (in my opinion) culminated into the world recognized genre Afrobeats being acceptable on the world stage. This quickly grew popular with Africans(inside and outside of the continent) and people of African heritage in the diaspora due to their ability to identify with different elements of this genre. Fela Anikulapo-Kuti was also a political activist who used his music as a tool to notify the world about the ills of the Nigerian society which was being ruled by military dictators at the time. 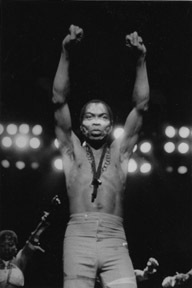 This obviously did not sit well with the government back then due to the exposés of their misdemeanours.Fela washed their dirty laundry in public, hence bringing the world`s attention to political tyranny in the country as it was…as well as securing a comfortable spot on the first page of their bad books. The Afrobeats genre has evolved over the years from close resemblance to more local African music, to being more international standard styled(if you like). This change in style, beats, and structure has brought the world`s attention to Afrobeat`s front door. Songs like Oliver Twist by D`banj , African Queen by Tuface Idibia, Chop my money(which means “Spend my hard-earned money”) by P-square etcetera have all received international attention due to their unique, indigenous, yet internationally tailored style. This has given rise to collaborations with A-list artistes like Kanye West, Rick Ross, Mary J Blige and loads more. These songs are being played alongside “big banging” tunes in clubs, rated on worldwide charts and reviewed by music critics. Oliver Twist by D`banj made it to the top 10 on MTV UK music charts which bases its ratings on downloads, hence making this song the most popular African song ever featured on the MTV charts. Personally, I believe this is just the beginning of a long journey for Afrobeats on the world stage, and also a big opportunity for African talents to showcase their skills and culture to the world without getting overly “Americanized” since you loose your culture when you loose your identity and uniqueness. Music has always been a universal language and even children will dance to a nice tune even though they do not have a clue of what the song is about. My advice to Afrobeats artistes in general is to keep it real with their roots i.e. Africa, and use their music as a communication, as well as an entertainment tool to the world. Please enjoy the attached video for your viewing pleasure. VIVA AFRICA!